Europe! You're so quirky. 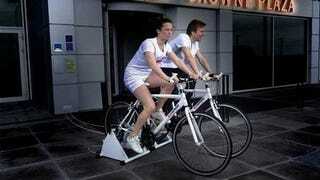 Specifically one Crowne Plaza Hotel in Denmark, which rewards guests who pedal on electricity-generating exercise bikes for 15 minutes with food. How long would I have to ride for a minibar pass? Once a hotel guest has produced 10 watt hours of electricity (which takes about fifteen minutes), they're rewarded with a $36 meal voucher. Pretty good deal! It's also not the hotel's only green initiative—it also has solar panels affixed to the roof.